Grumble grumble - it's me, Leslie debugging. Like I don't do enough of this during the day! This is very sweet! How nice to have an archive of your puppy's upbringing and from both of your points of view makes it even more special. Thanks Rebecca. 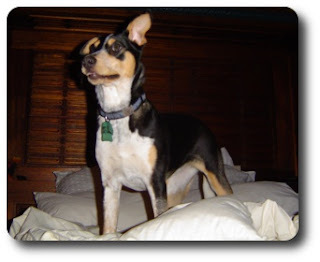 The whole reason I decided to do this blog thing was because, after losing Beau, I realized his 'stories' were fading from my memory and I wished I had them written down. I figured even if no one but Jan and I ever read this, it would serve as a history of our time with Bella. I'm so sorry your photos are trapped. I don't know the cost but there are places that can get data off crashed hard-drives if you ever want to try and retrieve them. I hope someday you'll be able to salvage them.